My neighbor was perched in the bucket of her John Deere tractor plucking fruit from the highest branches of her peach tree. My son and I arrived with cucumbers and kohlrabi from our garden to share, and ready to help. This is part of what I have come to expect and enjoy living in a community of rural neighbors. I stood on the ground picking what was within reach, while my son climbed a ladder, holding onto it with one hand and carefully selecting ripe peaches with the other. We rotated through our posts filling trays, and buckets doing our best to toss the rotten ones into the field where two labs anxiously awaited the sweet playthings. In a single hour, we had enough peaches to keep us in the kitchen for the weekend; my neighbor and I looked at each other knowing our plans have been dictated by the ripening of fruit on a tree. What a funny way to live when you don’t have to live this way. I could just as easily by peach jam and frozen peaches at the store. So why do we grow this food ourselves, and spend the time to make it? 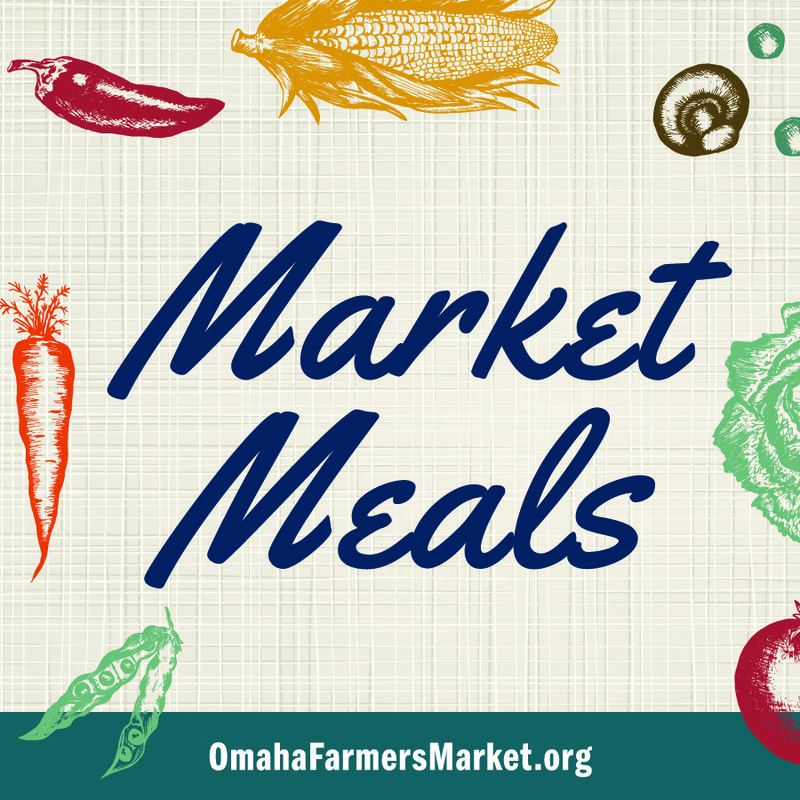 Why do we stroll the streets of the farmers’ market and bring all of that whole food home? After all, there are books to read, laundry to do, beds to make, and Netflix to watch. I have an inner voice that says, “You don’t need to take the peaches. You don’t need to spend the afternoon canning jam. You can buy peach jam at the store then do something else with your time.” But the peaches are there, and it’s a shame to pass them up. We lug them home, and I’m grateful for the food, and the time with my son and our neighbors. The truth is we’ve been a very plugged in family this summer. Both my husband I have been busy with work, and I was sick for nearly a month where our children discovered video games. I’m not ashamed to say I was happy for the electronic parenting assistance. It kept them busy and quite so I could rest. I’ve recovered from being sick, but breaking the habit of plugging in and checking out seems to be a bit more difficult to do. It’s why I picked the peaches. It was time to reconnect. My neighbor made my son’s day by letting him stand in the tractor bucket, and he learned a few lessons about helping others. The next day, I stood in the kitchen with my husband cooking down the fruit. He stirred the cauldron of jam, and I wiped rims and released air bubbles until well after our usual bedtime. 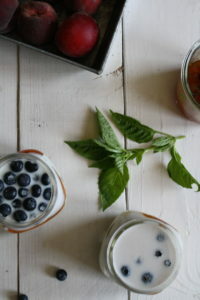 I make a few different versions of peach jam and water bath can them, but my favorite flavor is peach basil, which I always make as a small batch to keep in the fridge throughout the month. I don’t bother to water bath can it, because we go through it so quickly. 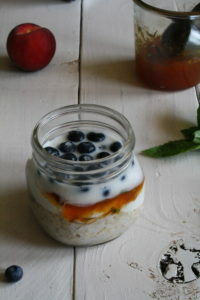 I stir it into overnight oats, spread it on toast with ricotta or use it as a marinade for meats and vegetables. Growing food, buying from the farmer’s market or helping my neighbors with their own garden is about controlling what my family eats, but is much more about participating in my community, and interacting with my own family in a way that is meaningful to me. 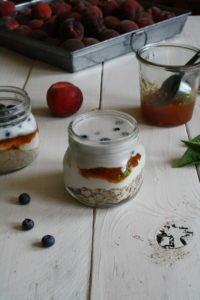 The first time I tried overnight oats I thought someone had played a cruel trick on me. Eating cold oatmeal was a new experience, and it took me a bit to decide if I liked them. Once I grew accustomed the texture, and figured out how to dress them up a bit, I fell in love with how easy they are to make for the whole family. Mornings are better around here, when we can eat a healthy breakfast I don’t have to think too much about. The best part is I stay full until lunch. My husband and I will both eat a pint jar. For our kids, who are 6 and 8 years old, I halve the recipe and make it in a ½ pint jar. You can find the recipe for Peach Basil Jam here. If you are not interested in making jam, you can buy peach jam from someone who does love to make it. Combine a ½ tsp of minced fresh basil leaves with a ¼ cup of jam and proceed with the recipe below. 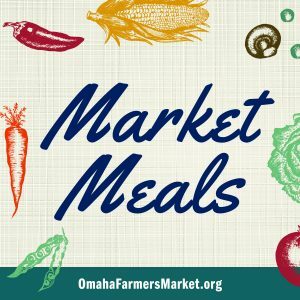 1/4 cup peach basil jam – click HERE for recipe. 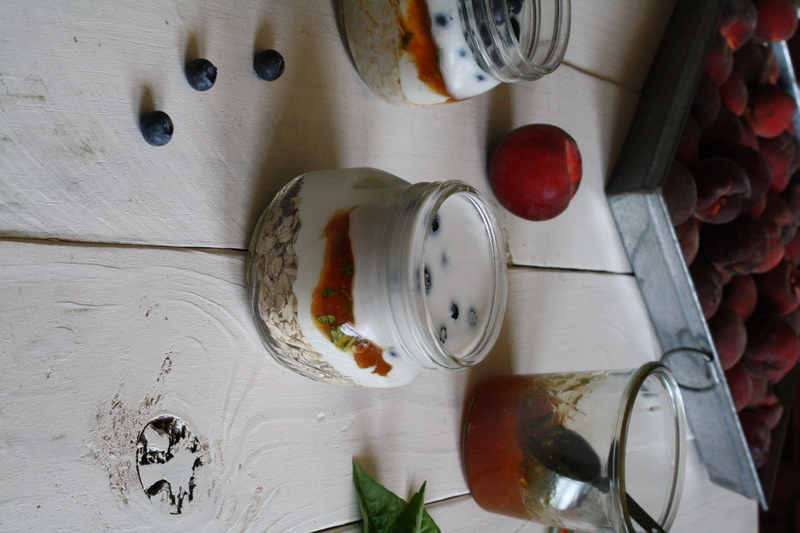 Combine everything in jar the night before you want to eat if for breakfast. Stir. Keep in fridge for 12-24 hours. Eat cold. Enjoy a healthy breakfast without the rush.